Kirsten Grindel leads the Durant girls basketball team in scoring. 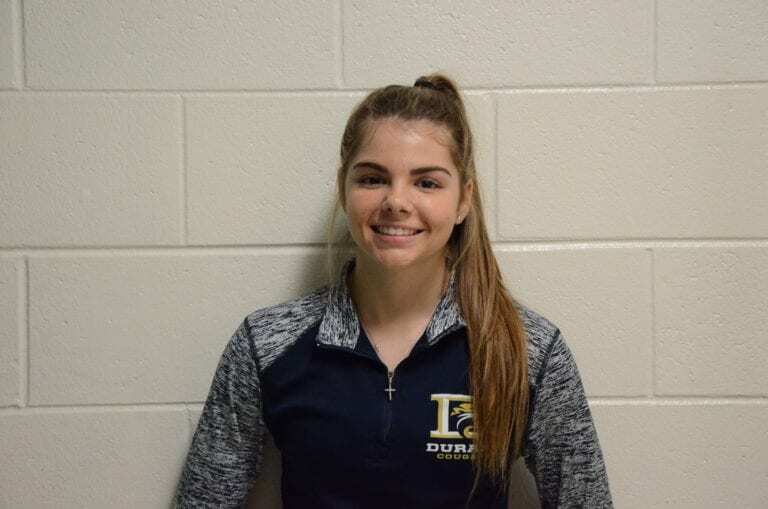 Kirsten Grindel, Durant’s top sophomore, is averaging a career-best 14 points and 3.5 steals per game in 2019. Her 26 points, five steals and four assists against Plant City on Jan. 8 helped push the Cougars past the Raiders, 61-38, in the crosstown rivalry game. From your perspective, how’s the season going for you all? I think that, given the circumstances where we don’t have a lot of girls, I think the season’s going pretty well. What’s working for you out there this year? I think this year we have a lot more teamwork and more girls who are athletic. Not that last year’s weren’t, but we have more in general and it’s easier to sub girls out and get up and down the floor. Where do you think you’ve improved the most since last year? My confidence definitely improved and my IQ of the game improved as the year went on. I’m just trying to get up on the leaderboard with steals and scoring. I want to reach out to colleges and see if there’s any interest in a couple years. I would go to Purdue. They have the academic program that I want to go for and a really good basketball team. I fell in love with the idea of it. It’s speech and psychology. I want to work with kids who have disabilities and help them learn how to speak, stuff like that. You also run cross country and track. How long have you been in these sports? I’ve been playing basketball since I was in fifth grade so six years, almost. Five or six years. I just started running competitively last year for high school. My dad did it, and they kind of pushed me to do it to stay in shape for basketball. I was good at it so I continued to do it. Same thing. My dad played his whole life and always talked about how much he liked it. I was always a really athletic kid. Growing up, I liked playing every sport. I tried it and fell in love with it and I continued to do it. I like the competitiveness, the intensity like when it’s close and you have the crowd screaming at you… I like the feeling of that. What’s your proudest moment as a Cougar so far? Definitely the first game of the season, we came in and were all nervous. It was a really close game. I hit the buzzer beater and it wasn’t even that I hit it, it was that the whole team came on the floor. It felt like we just won a championship, but it was just the first game. It’s that feeling of excitement.